"PolyNome is an invaluable tool that offers everything a musician can ask for in a metronome. Its immense amount of features allow you to work on everything from to sticking patterns to polyrhythms with ease and freedom to customize." 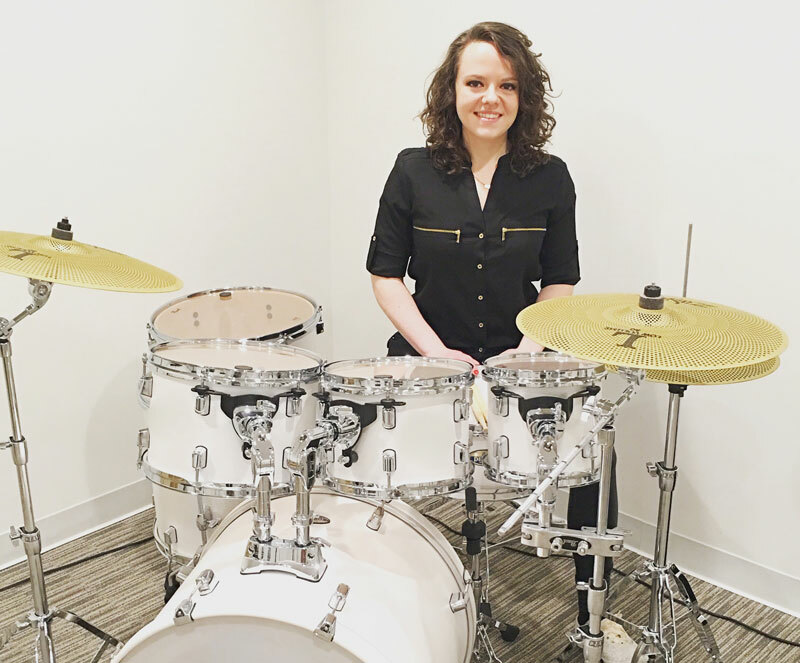 Lindsay graduated from Berklee College of Music in May 2016 with a B.A in Professional Music, and was a featured drummer in the annual commencement ceremony concert. While at Berklee, she concentrated on Drum Set Performance and Music Business. Her education also strengthened her skills in Music Theory, Harmony, Ear Training and Songwriting. Some teachers she studied with at Berklee include Bob Gullotti, Dave Dicenso, Ralph Peterson, Kim Plainfield, Henrique De Almeida, Tony Thunder Smith, Jon Hazilla, and Terri Lyne Carrington. In May 2015, Lindsay won 1st place in Hit Like a Girl, an international competition for female drummers. Judges included Kim Thompson (Beyoncé, Late Night with Seth Meyers), Venzella Joy (Beynoncé), Didi Negron (Cirque De Soleil), Hannah Welton (Prince) and more. Lindsay is now based in Los Angeles, California. She’s performed with artists of Pop, Rock, Fusion and Jazz Genres at filled arenas as well as intimate venues. She also has extensive filming experience, having played drums for TV commercials, TV Show Pilots and music videos. Lindsay is an avid Drum Set Clinician and Music Educator, and presents masterclasses at conventions, institutions and universities. Most recently, Lindsay traveled to the cities of Dalian, Zhuhai, Macau and Beijing for her 2017 China Drum Clinic Tour, sponsored by 9 Beats Education Institution for Modern Music. She was also featured in the 2015 Percussive Art Society’s International Convention, New York University’s 2016 Annual Day of Percussion, and The Collective in NYC. Lindsay teaches private Drum Lessons in Los Angeles, and Skype Drum Lessons to drum students all over the world. She’s collaborated with DrumChannel, was featured in magazines such as DRUM! and TomTom, is a writer for TomTom Magazine, and has created video collaborations with drummers such as Kiran Gandhi and Shariq Tucker. Lindsay also composes, records, and produces original music. I use PolyNome throughout the majority of my practice routine. I aim to use the metronome at least 90% of the time while practicing so that I’m not only working on whatever the subjects are, but also my timing simultaneously. I have settings for each of my main warm ups, such as Stick Control, Rudimental Ritual, Accent Sheets, and others. They include rhythms, subdivisions and accents that pertain to each exercise. My favorite sequence I’ve created is the Times Table chart. I set the PolyNome rhythm to go from quarters, to eights, triplets, sixteenths, quintuplets sextuplets, sevens, and 32nd notes, then back down in reverse order. I use this to practice navigating from these subdivisions from slow to fast and fast to slow. I apply this rhythmic pattern to my hands and go through various stickings and feet ostinatos. I also use different hand/feet combinations such as alternating between snare LH / ride bell RH and RF on the bass drum filling in notes in between. Many of these patterns come from Henrique De Almeida’s “Polyrhythmic Possibilities” book. I also use PolyNome to accurately practice different polyrhythmic combinations. It’s extremely helpful to play along with a metronome while internalizing advanced polyrhythms, and the option to change the samples for both rhythms helps to hear the exact note placements. I look forward to experimenting with and discovering more ways to use the app.